Paper summary aleju * The authors start with a standard ResNet architecture (i.e. residual network has suggested in "Identity Mappings in Deep Residual Networks"). * Their residual block: ! [Residual block](https://raw.githubusercontent.com/aleju/papers/master/neural-nets/images/Wide_Residual_Networks__residual_block.png?raw=true "Residual block") * Several residual blocks of 16 filters per conv-layer, followed by 32 and then 64 filters per conv-layer. * They empirically try to answer the following questions: * How many residual blocks are optimal? (Depth) * How many filters should be used per convolutional layer? (Width) * How many convolutional layers should be used per residual block? * Does Dropout between the convolutional layers help? ### Results * *Layers per block and kernel sizes*: * Using 2 convolutional layers per residual block seems to perform best: ! [Convs per block](https://raw.githubusercontent.com/aleju/papers/master/neural-nets/images/Wide_Residual_Networks__convs_per_block.png?raw=true "Convs per block") * Using 3x3 kernel sizes for both layers seems to perform best. * However, using 3 layers with kernel sizes 3x3, 1x1, 3x3 and then using less residual blocks performs nearly as good and decreases the required time per batch. * *Width and depth*: * Increasing the width considerably improves the test error. * They achieve the best results (on CIFAR-10) when decreasing the depth to 28 convolutional layers, with each having 10 times their normal width (i.e. 16\*10 filters, 32\*10 and 64\*10): ! [Depth and width results](https://raw.githubusercontent.com/aleju/papers/master/neural-nets/images/Wide_Residual_Networks__depth_and_width.png?raw=true "Depth and width results") * They argue that their results show no evidence that would support the common theory that thin and deep networks somehow regularized better than wide and shallow(er) networks. * *Dropout*: * They use dropout with p=0.3 (CIFAR) and p=0.4 (SVHN). * On CIFAR-10 dropout doesn't seem to consistently improve test error. * On CIFAR-100 and SVHN dropout seems to lead to improvements that are either small (wide and shallower net, i.e. depth=28, width multiplier=10) or significant (ResNet-50). ! 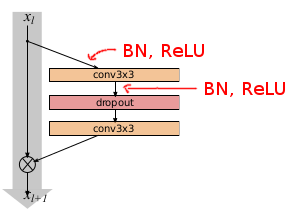 [Dropout](https://raw.githubusercontent.com/aleju/papers/master/neural-nets/images/Wide_Residual_Networks__dropout.png?raw=true "Dropout") * They also observed oscillations in error (both train and test) during the training. Adding dropout decreased these oscillations. * *Computational efficiency*: * Applying few big convolutions is much more efficient on GPUs than applying many small ones sequentially. * Their network with the best test error is 1.6 times faster than ResNet-1001, despite having about 3 times more parameters. Abstract: Deep residual networks were shown to be able to scale up to thousands of layers and still have improving performance. However, each fraction of a percent of improved accuracy costs nearly doubling the number of layers, and so training very deep residual networks has a problem of diminishing feature reuse, which makes these networks very slow to train. To tackle these problems, in this paper we conduct a detailed experimental study on the architecture of ResNet blocks, based on which we propose a novel architecture where we decrease depth and increase width of residual networks. We call the resulting network structures wide residual networks (WRNs) and show that these are far superior over their commonly used thin and very deep counterparts. For example, we demonstrate that even a simple 16-layer-deep wide residual network outperforms in accuracy and efficiency all previous deep residual networks, including thousand-layer-deep networks, achieving new state-of-the-art results on CIFAR-10, CIFAR-100 and SVHN. * The authors start with a standard ResNet architecture (i.e. residual network has suggested in "Identity Mappings in Deep Residual Networks"). * Several residual blocks of 16 filters per conv-layer, followed by 32 and then 64 filters per conv-layer. * How many convolutional layers should be used per residual block? * Does Dropout between the convolutional layers help? * Using 3x3 kernel sizes for both layers seems to perform best. * However, using 3 layers with kernel sizes 3x3, 1x1, 3x3 and then using less residual blocks performs nearly as good and decreases the required time per batch. * Increasing the width considerably improves the test error. * They argue that their results show no evidence that would support the common theory that thin and deep networks somehow regularized better than wide and shallow(er) networks. * They use dropout with p=0.3 (CIFAR) and p=0.4 (SVHN). * On CIFAR-10 dropout doesn't seem to consistently improve test error. * On CIFAR-100 and SVHN dropout seems to lead to improvements that are either small (wide and shallower net, i.e. depth=28, width multiplier=10) or significant (ResNet-50). * They also observed oscillations in error (both train and test) during the training. Adding dropout decreased these oscillations. * Applying few big convolutions is much more efficient on GPUs than applying many small ones sequentially. * Their network with the best test error is 1.6 times faster than ResNet-1001, despite having about 3 times more parameters.